Southampton have no new injury worries following the international break as they prepare to face Stoke. Southampton manager Ronald Koeman claims Long was not fully fit to play on Monday. SOUTHAMPTON BOSS RONALD Koeman has spoken of his surprise at striker Shane Long featuring for Ireland in the Euro 2016 play-off second leg against Bosnia-Herzegovina during the week. “I was quite surprised that he played 40 minutes,” Koeman said. “Of course our doctor had contact with the medical staff of the Irish national team and my information was he still was not 100% fit. “I don’t like to say more because that’s not the way; the way is to contact them and if we are not happy we have to tell them. That’s the first step. Despite Long’s unexpected match action, Southampton’s international contingent returned from international duty with no new injuries ahead of the visit of Stoke and Virgil van Dijk is available for selection despite picking up a knock playing for the Netherlands against Wales. 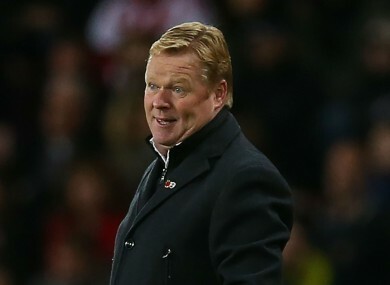 Email “Ronald Koeman was not impressed with Ireland picking Shane Long during the week”. Feedback on “Ronald Koeman was not impressed with Ireland picking Shane Long during the week”.